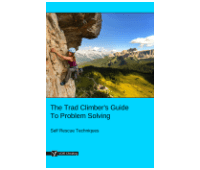 This 'Garda Hitch' article is part of the e-book - The Trad Climber's Guide To Problem Solving. The garda hitch uses two parallel carabiners to create a system where a loaded rope can move in one direction but not the other. Secure two D-shaped carabiners together with a girth hitch so they lie parallel with the gates on the same side. Clip the rope through both carabiners. Form a loop in the non-loaded strand as shown. Clip this loop through the left carabiner and fasten the screwgates. Pull the loop back so it sits around the spine of the carabiners. The garda hitch is now complete. You will be able to pull rope through in one direction only. Make sure you have it the right way around. * The garda hitch is a one-direction knot – it cannot be released under load. Be careful how you employ it. * It’s vital that you use D-shaped carabiners. 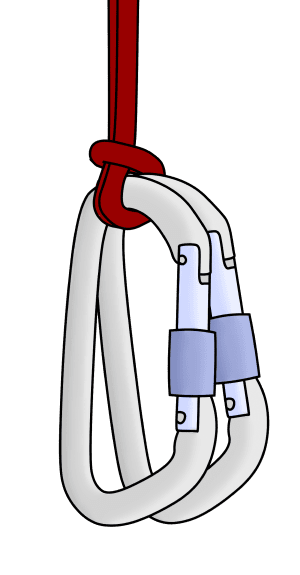 A garda hitch tied on HMS or oval carabiners is prone to slipping down which causes the knot to fail. * You must girth hitch the two carabiners together. If you simply clip the carabiners through a sling or another carabiner, the garda hitch will not function correctly.